This was a nice weekend. We had a couple of commitments, but otherwise it was a nice, quiet couple of days. Our first stop was for one of Melody's little cousins. It was Judah's 5th birthday party, and we had a nice time helping him celebrate. I spent most of the party chatting with Uncle Jerry, or UJ (shout out: Hey, UJ!). UJ told me a delicious story about him and Aunt Janice going out to eat pancakes, and how they were talked into getting all-you-can-eat pancakes, and even after they ate all they could eat, the waitress kept bringing more. I had an immense craving for pancakes when he finished the story. We also talked about diet drinks. UJ mentioned his daughter-in-law was trying to cut back on sugary drinks, but didn't care for diet soda. I told him about my new favorite drink: Sparkling Ice! 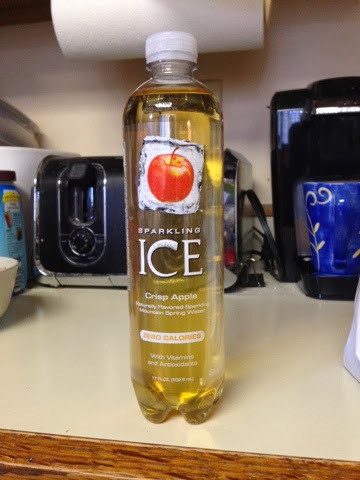 Sparkling Ice is a carbonated flavored water that has zero calories, and is one of the best tasting on the market. It comes in multiple flavors, my favorites being the Crisp Apple, Coconut Pineapple, and Black Raspberry. The only hassle so far has been finding it. We originally found it at Harris-Teeter, but it took awhile before Wegman's and Weis started carrying it. I love it, but at a dollar a bottle (on sale), it's not the cheapest drink around. The bottles are 18 oz., though, so that's good. After we left the party, and with the weather hovering in the lower 60s, we decided to take the front panels off the top of our Wrangler for the first time. It felt great, and it wasn't as windy as I expected, but it also wasn't quite as warm as we thought, either. We were in the neighborhood, so we stopped by Mom & Dad's for a brief visit. We hadn't seen them in a few weeks. We ended up watching some old videos of when Melody was about 2 years old, and also of Faithful Pup Scout when she was a puppy. It was neat to see. It was nice to reminisce. We headed home to clean up, and we put the panels back on the Jeep, then we went to church. It was a nice service. I always get something out of Mark's messages, and I left feeling gung-ho about trying to improve my work-home-life. Afterwards, we went to dinner at.....you guessed it, IHOP! I was craving pancakes by this time, and I got a stack of blueberry pancakes. Melody got the chocolate chocolate chip. I don't know how she does it, but she loves her chocolate. That's just too much chocolate for me to even think about. The scrambled eggs, hash browns, and turkey bacon, along with the blueberry cakes, made for a delicious comfort food dinner. To really add to the overkill, though, we also stopped at Sweet Frog for some frozen yogurt, before heading home for the evening. It was a great day! We followed it up with a good night's sleep, though the time change knocked me out until 9:15. Once I was up, though, I was up for good. We didn't do much today. I paid some bills, watched an incredible finish to the Terps men's basketball game versus UVA. Maryland won 75-69 in OT. It was their last regular-season ACC game, so it was great to go out as winners. Now it's time to turn in. Have a great evening, everyone! Things That Make Me Ask, "Why?" Did I Really Just Write a Post About Shoes?!? The Last Great Snow Day of 2014?